It is widely known and liked soup, not only in Poland but mainly in Eastern Europe. I used sour beetroot juice I made earlier, but you can easily add acidity to your barszcz by adding either vinegar or lemon juice - it's not 'authentic' but you'll get pretty similar result. Barszcz in Poland is mainly eaten on Fridays, as it's usually vegetarian soup and in many parts of Poland during Wigilia, on Christmas Eve. I like mine with a hard boiled egg and boiled, diced potatoes, sometimes with a teaspoon of cream to make it less sour. Traditionally barszcz is served with uszka or sometimes with a krokiet on the side. It's completely up to you and your own taste how you eat it! Combine all the ingredients in a pot and boil for few minutes. Check seasoning. Also if it's too sour you might want to add a teaspoon of caster sugar. 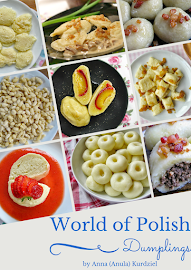 Serve with traditional Polish uszka or simply with boiled potatoes and/or hard boiled egg. The above is a basic recipe. If you don't have fermented beet juice make 1-1 1/2 vegetable stock, take 3-4 beetroots, peel and dice them and boil till tender in the stock. Add vinegar or lemon juice to make the soup sour. Then add the spices as per above.